MSV: Legalized gambling coming to Hudson and Hoboken? Legalized gambling coming to Hudson and Hoboken? A November referendum on casino gambling moving to northern New Jersey from Atlantic City is gaining attention and questions about its proximity to Hoboken are being noticed. The question of having two casinos in our area is beginning to take shape with groups on both sides making noise on the issue of legalized gambling in our area. Some of the proposed locations mentioned are Jersey City, the Meadowlands but some chatter locally thinks an area of northern Hoboken may be a potential location owned by the Rockefeller Group. The issue is beginning to heat up even before the traditional focus on November elections after Labor Day. Some state officials fear an approval of casinos in northern New Jersey will lead to more Atlantic City casino closures while others support the idea saying it will generate $200 million annually for the seaside city as part of a complex agreement. Back in July, NJ State Senator Steve Sweeney came out in favor co-sponsoring a plan for legalized gambling in northern New Jersey in a Wall Street Journal article. After a bitter battle over a proposed state takeover of Atlantic City, supporters of a gambling expansion are ramping up efforts to convince voters to allow new casinos in the northern part of New Jersey. Lawmakers agreed in January to allow a ballot referendum this fall on a proposal to expand casinos into southern New Jersey. 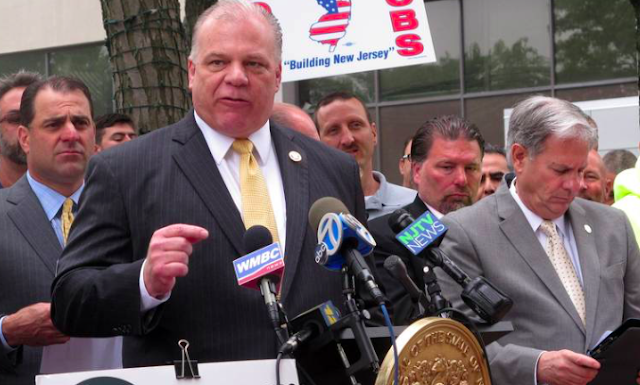 NJ State Senator Steve Sweeney supports a November referendum to add legalized gambling with two casinos in northern New Jersey. The NJ Senate Majority Leader is anticipated to be a candidate next year in a run for NJ governor. Talking Ed Note: PolitickerNJ reported on the Assemblyman chairing Tourism, Gaming and the Arts Committee, Ralph Caputo (D-Nutley) who urges voters to approve the casino referendum in November. He says there are organized forces who don't want to see NJ enjoy further revenues at their expense.